Much of the recent growth in the nation’s public school enrollment has occurred in suburban school districts. Since 1993-94, public school enrollment has grown by 5.1 million students (Table 1). Suburban school districts have educated an additional 3.4 million students, so suburban schools have accommodated two-thirds of the enrollment increase. The growth in suburban education has had the effect of reducing the share of public school students enrolled in either a city school district or a town and rural district. Suburban schools educated 38% of the nation’s students in 2006-07, an increase from 35% in 1993-94. City school districts educated 31% of the nation’s students, down from 32% in 1993-94. Town/rural school districts also have lost share since 1993-94. The growth of the suburban share of enrollments reflects at least two documented trends among the wider U.S. population. First, among people living in metropolitan areas, a growing share reside in the suburbs (Frey, 2001). Second, since 1990, a growing share of the nation’s population resides in metropolitan areas (Fischer and Tienda, 2006). The latter trend is consistent with the decline in the proportion of students educated in town and rural school districts. The growth in enrollment at the nation’s 3,259 suburban school districts is almost entirely due to minority students. Minority enrollment in suburban school districts increased by 3.4 million students since 1993-94 (an 82% increase). Suburban white enrollment levels have remain unchanged compared with 1993-94. White enrollment in both city school districts and town and rural districts has declined since 1993-94 (Appendix B Table B1). The minority enrollment growth has markedly changed the racial/ethnic makeup of suburban school districts considered as a whole. The white share of the suburban student population has declined from 72% in 1993-94 to 59% in 2006-07 (Figure 3). All the major minority racial/ethnic groups have increased their suburban representation. 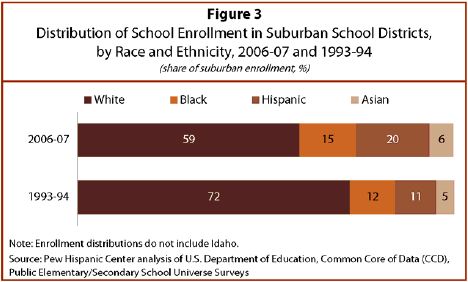 The Asian share of suburban enrollment increased a percentage point since 1993-94. Black students constitute 15% of suburban enrollments, up from 12% in 1993-94. Much of the growth in suburban enrollments is due to increased Hispanic enrollment. Suburban Hispanic enrollment increased by 2 million students since 1993-94 and Hispanics were 20% of suburban enrollment in 2006-07, an increase from 11% in 1993-94. The fact that whites are a declining fraction of suburban students likely reflects more than just the larger demographic changes that have occurred in the population. As Table 2 shows, the white share of the school-age population fell by at most 11 percentage points since 1993 (from 69% to 58%).1 Among the nation’s entire public school students, enrollment of white students fell by at most 10 percentage points (from 66% to 56%). In suburbia, though, the white share of public school enrollments fell by 13 percentage points. So racial/ethnic diversification has been particularly acute in suburban school districts. Note as well that suburban school districts have lost some of their distinctiveness. In 1993-94, whites made up two-thirds of the nation’s public school population. In the suburban districts, though, whites accounted for 72% of enrollments. Increasingly, suburban districts resemble the nation as whites comprise 56% of enrollments nationally. Suburban districts are only slightly more white, with whites comprising 59% of suburban enrollments.